The sg2014 Workshop will be organised around Clusters. Clusters are hubs of expertise. They comprise of people, knowledge, tools, materials and machines. The Clusters provide a focus for workshop participants working together within a common framework. 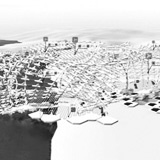 Clusters provide a forum for the exchange of ideas, processes and techniques and act as a catalyst for design resolution. The sg2014 Workshop is made up of ten Clusters that respond in diverse ways to the challenge 'Urban Compaction'. The Bearable Lightness of Being is about designing and producing an event structure so light-weight that it will be able to be taken for a walk or even fly away. BLOCK will test and develop a generative and analytically video game to speculate on the role of planning in spontaneous urban growth. Design space exploration for Urban Compaction will investigate new computational design methods to synthesise urban designs according to specified requirements. Flows, Bits, Relationships: Visualising Social Space will experiment with organising data through an interconnected graph database to develop new ways to visualise and understand the spatial complexity of Hong Kong’s dense, interconnected commercial spaces. Fulldome Projections invites participants to map Hong Kong’s temporary urbanism in order to project and explore future urban scenarios within an immersive environment. HK_smarTOWERS, drawing on the ubiquity of the high rise in Hong Kong, will focus on data harnessed from this typology and on its analysis and visualisation, as well as its use as design driver for novel approaches to tower massing, structure and organization. Private Microclimates will explore strategies to design context specific mitigative thresholds for creating comfortable dwelling spaces. Resilient Urban Network s will will apply the knowledge and digital tools of network resilience to dense urban infrastructure, informing the design and fabrication of working physical models. Spaces in Experience will explore human experience in relation to adaptive environments through experiential sketching: a combination of actor training, people tracking, physical modelling and augmented reality.